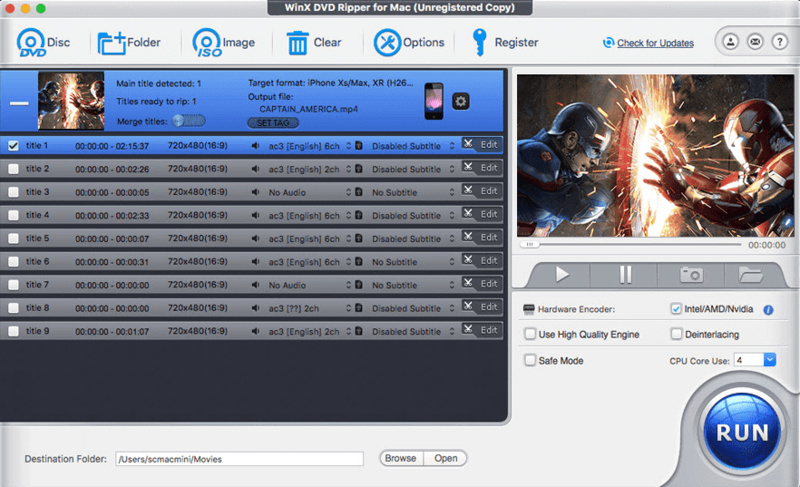 WinX DVD Ripper for Mac is an all-in-one Mac DVD ripper designed to rip DVD or DVD ISO to all prevailed video formats on Mac, e.g. rip DVD to MP4/H.264, MKV, iTunes, MOV, FLV, MPEG, AVI, etc. 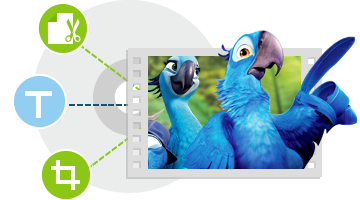 With 350+ profiles, it can faultlessly convert all DVDs (incl. old damaged DVDs and latest DVDs) to iPhone Xs/Xs Max/XR/X/8/7 Plus, iPad, iPod, Apple TV, iTunes, iDVD, iMovie, Android, Huawei, Google Nexus, Kindle Fire, Surface, WP8, PSP, etc. It gives you ultra-fast ripping speed with support of multi-core CPU (up to 8-core processor) and Hyper-threading technology. Furthermore, this Mac DVD ripper helps copy DVD to Mac hard drive and USB at 1:1 ratio with original video and 5.1 Channel AC3/DTS Dolby audio in 5 minutes, and it is capable of ripping DVD to MKV video still keeping all audio subtitle tracks and chapters. The strongest for 99-title DVDs and always the 1st to support new DVDs. The installer above is only for 64-bit. Copy DVD with X2 faster speed than others. 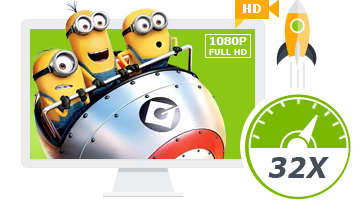 Accelerate DVD ripping speed with support of Multi-core (up to 8) CPU & Hyper-threading. 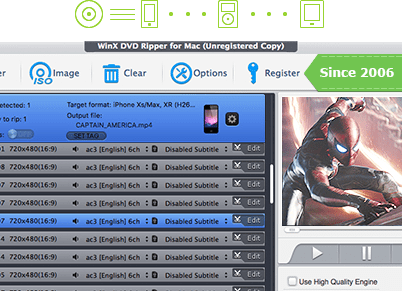 WinX DVD Ripper for Mac gives perfect performance to rip and convert DVD to iTunes, DVD to MP4, MKV, MOV, M4V, AVI, FLV, MP3, etc. for smoothly playback on various video players, like, QuickTime player, or for further edition in iMovie, iDVD, Final Cut Pro and many others. Due to the myriad of mobiles and tabs that exist, you need a DVD ripper that provides a multitude of ripping formats. With preloaded 350+ profiles, this Mac DVD ripper completely supports portable devices by converting DVD to iPhone Xs/Xs Max/XR/X/8/7 Plus, DVD to iPad/Pro/mini/Air, DVD to iPod/5, Android, Apple-TV/4 without quality loss. Thus, you can enjoy beloved DVD movies anytime. This DVD ripper for Mac enables Mac fans to make perfect backup of DVD content to hard drive and USB by copying DVD to MPEG2 files with original video quality and 5.1 Channel AC3/DTS Dolby audio within 5 minutes (depend on your CPU and DVD driver speed). Therefore, users can view DVD movies without taking tons of DVDs anywhere. 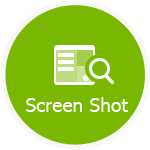 Add Subtitle --- Attach downloaded SRT subtitle files in any languages. Merge --- Choose and combine several titles of DVD into one single video file. Trim --- Extract video clips/segments from DVD to cut off the trailers and ads. Crop --- Remove frame area to cut off unwanted borders, backdrops. WinX DVD Ripper for Mac allows you to flexibly set CPU utilization to make full use of up to 8 core processor, and supports Hyper-threading technology to provide the fastest speed to rip DVD movies. Built in High Quality Engine, this DVD ripper for Mac could also keep the original audio video quality after converting DVD to video. This Mac DVD ripper owns the abilities to take a snippet of DVD movie by specifying start and end time, take snapshot from stream video, and extract audio to be saved in MP3 format. Wherefore, you can edit your favorite DVD video segments, play fantastic movie music, save beautiful wallpapers for Mac, iPhone, iPad/Air/Mini, iPod, tab, etc. Designed with straightforward interface, it is user friendly and easy to use. Users can set all audio and video parameters, such as frame rate, bitrates, volume and resolution, and edit the display name and artist name for playing DVD on iPhone, iPad, iPod, Android, Samsung Galaxy, HTC, Surface, Nexus, etc. The latest released DVD has 99 titles and the DVD size is larger than 40 GB. When ripping such kind of DVD, common DVD ripper usually crashes or works out of order. 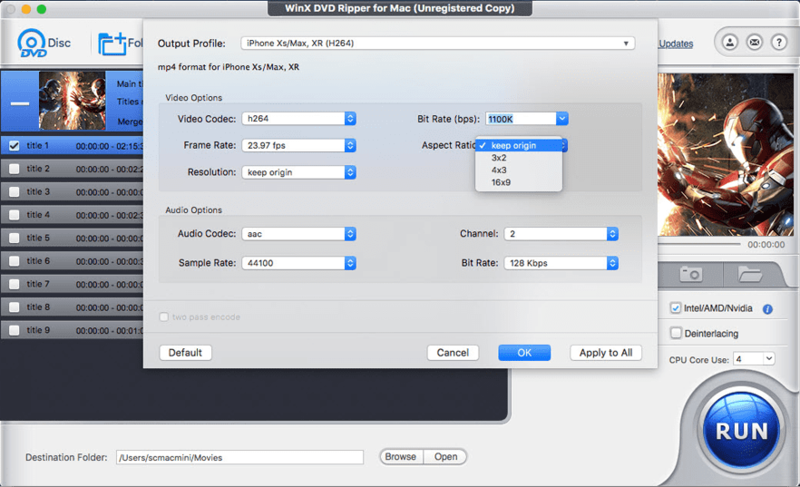 WinX DVD Ripper for Mac is able to auto select the right DVD title and smoothly rip DVD from the main movie content with correct order. It's constantly updated to support the latest DVDs. How to Rip DVD to iPhone X/8 (Plus) etc. 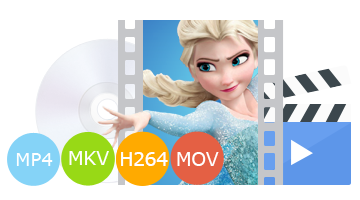 The best solution to rip and convert any homemade, commercial and read-only (Disney) DVDs to iPhone X/8 (Plus) videos on Mac. It keeps updating such that playing back the latest DVDs on iPhone X/8 (Plus) would be a cinch. How to Rip a DVD on Mac without Optical Drive Apple kills disc drive on new Mac models, like Macbook Air, MacBook Pro, Mac Mini. This change urges us to find a solution to rip DVD on Mac without optical drive. This article focuses on how to rip a DVD on Mac without optical drive. 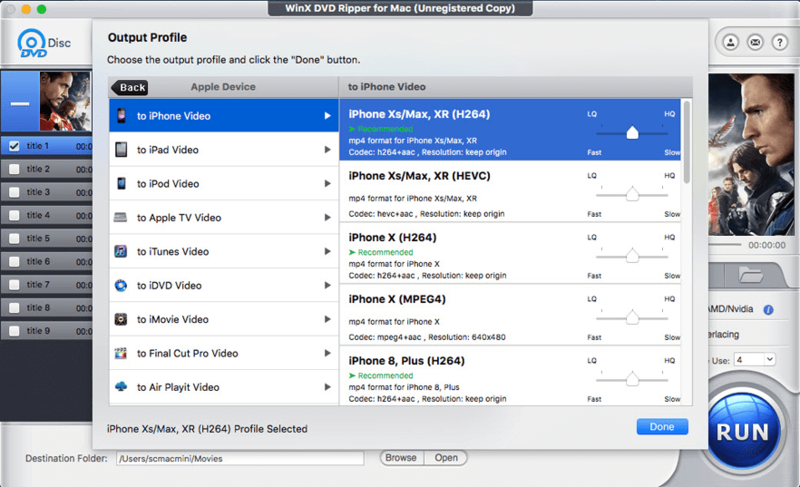 Best DVD Ripper Software for macOS Mojave Among the Mac DVD rippers, WinX DVD Ripper for Mac is the best 10.14 macOS Mojave DVD Ripper to backup, rip and convert DVDs on macOS Mojave for playing DVD videos flexibly on Mac, iPhone, iPad, iPod, etc. 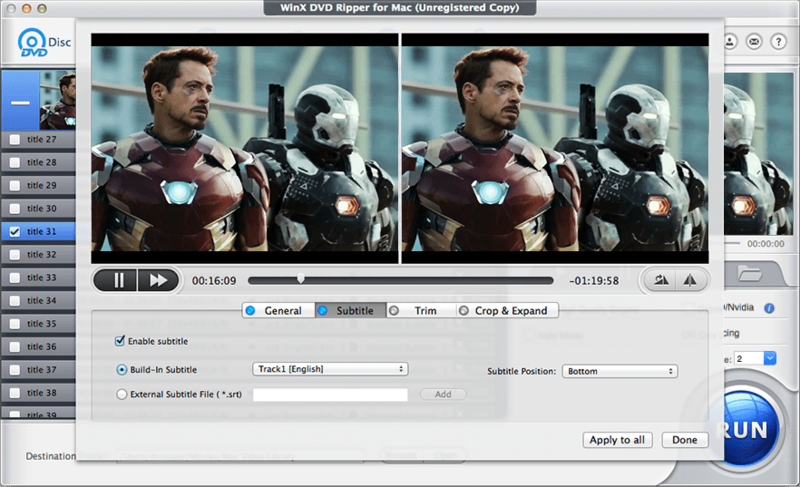 Review of Top 5 Free DVD Rippers for Mac 2019 List of top 5 DVD rippers for Mac 2019 with user tutorial on how to use best free Mac DVD ripper to rip DVD movies to MP4, AVI, MOV, etc. 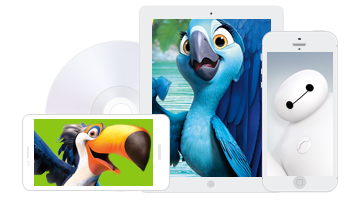 You can playback DVD movies on Mac, iPhone, iPad, PC, Android phones and tablets easily. How to Batch Convert ISO to MKV on Mac When converting the latest purchased DVDs, nearly all common DVD rippers come up with crash or out of order for special protection technology. This Mac DVD ripper could smoothly bypass it and rip DVDs to MOV, FLV, MP4, AVI, etc. 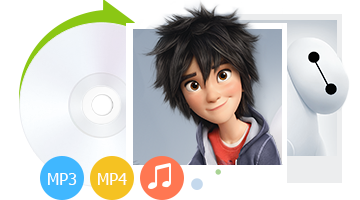 DVD ISO image, MPEG-2 (DVD), MKV, MP4, MOV, M4V, FLV, H.264, MPEG4, AVI, WMV, AVC, MTS, TS, M2TS, etc.